When crafting leather﻿ shoes, it is important that the design and the stitching are done properly. Gluing the leather is also essential to shoe design. And while the glue should not be your main focus, overlooking what type of glue you use can have negative effects on the overall professionalism of your craft If you choose a glue which does not have a strong adhesive, the seals will break and the shoe may fall apart. On the flip side, if you have a glue which dries and contracts too much it may pull the leather and work adversely to the stitching. Here are a few of the best glues for leather shoes. This glue is intended for permanently bonding leather together and so it is a suitable choice when looking for the best glue for leather. Aleene’s Leather & Suede Glue comes in a 4oz container and dries clear. It is not advised that this be used on large portions of the shoe, but rather on those touch up spaces and detail work. While the glue does come out of the tube thick and colored, it dries clear. There is a slight aroma when wet, but it dries clear and odorless. Customers have stated that the bonding of the glue is not as strong as they anticipated. Leather artists are encouraged to use a clamp or a press when using this type of glue. Needle point nose makes for easy flow of glue too hard to access spaces while the screw cap allows for the leather worker to pour and brush if needed. Glue is dry clean only which may play against the method of cleaning for the leather being used. Check your leather first to establish that the glue you are using does not limit the cleaning or conditioning of the leather on the shoe. Not strong enough to work on high abrasion surfaces, only good for detail work. Best suited for those which have leather shoe designs with small stationary details which need to be glued and stitched. 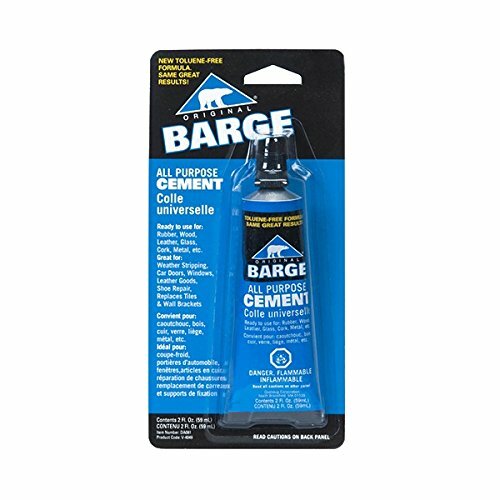 For many, this glue is considered a hobbyist glue and not on the same level as a professional grade glue. Leather working should with this glue should be coupled with nice stitching skills. 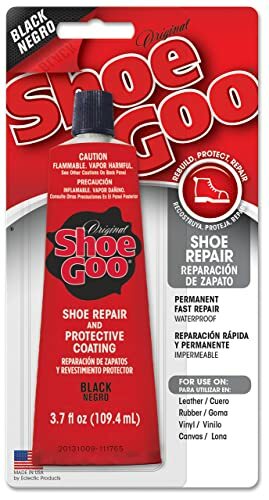 Rubber soles can come away from shoes overtime and cause the shoe to become useless and many shoes may have to be discarded, but Shoe Goo can save your shoes from the waste bin by repairing them to perfection. Typically heat and water are the main reasons why a sole will come off the leather of a shoe. Leather artisans are encouraged to dry and treat the leather for any repairs which may be needed, including leather conditioner and leather cleaner before applying glue. Comes in 3.7 oz. tube, but is sold in multiples so you never have to worry about drying out. Waterproof, so there is never a worry when using this product on any shoes you choose. Very versatile product. Great for vinyl, leather, and rubber soled shoes. Can be difficult to use due to the blunt tip of the applicator. May not hold when applied to work boots. Product is black and therefore it can be quite messy to apply. The quantity of the glue tends to be a bit low for most projects. This product works best when shoes are allowed to dry completely before wear. It is not intended for projects that require a quick fix. The glue must be allowed to sit or you run the risk of breaking the seal on the glue. For maximum performance clean the leather surface which is to have the glue applied prior to using. Even the highest quality made shoes can sometimes begin to show wear and tear. That is not the time to panic or even get rid of the shoe. The right type of glue can fix the problem with ease ,and Gear Aid Freesole Urethane Formula Shoe Repair is all the adhesive you will need for any shoe repair. When compared to other shoe repair products, this adhesive always seems to come out on top. You should be careful when using this product to keep the glue off of your hands. The thinner nature of its composition make the glue a bit hard to control in some situations. Plan your project and use minimal amounts of glue at a time for best results. Dries clear so therefore there is minimal mess involved in using the product. Increases shock absorption and tread for maximum durability. Great for use in all types of footwear whether you need to repair your boots, running shoes, or your favorite pair of leather shoes. Cap can stick so to avoid this, make sure that the tip is completely clean before applying the lid back to the product. Adhesive can get stuck to hands and is difficult to remove. Gloves are recommended when applying the product. This product will adhere to just about any surface so make sure that you repair shoes on a surface that you do not mind the glue getting on or put down a barrier to prevent any unwanted glue from getting on the surface. 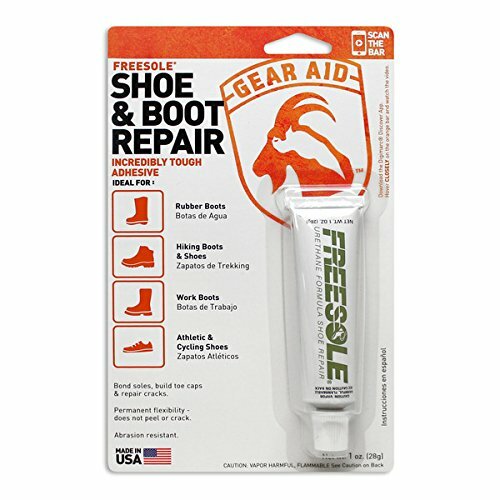 Gear Aid Freesole Urethane Formula Shoe Repair comes in a 1oz tube that is convenient to use multiple times when properly cleaned and stored after each use. Realistically, you will probably need to purchase a few tubes of glue. In most situations this would be a back up glue or an emergency glue due to the small tube. If you want to be assured that your shoes will hold when they are repaired, the most trusted source is Gorilla Glue. Original Gorilla glue is the perfect adhesive for a strong, durable hold for all types of shoes. Best of all, this product is good for a variety of repairs to damaged leather. Gorilla Glue has long been used by professionals in a variety of different fields for a secure hold on securing different types of items. This product is sure to give you the hold you desire, without the mess and strong odor of some other glues on the market today. The downside to using gorilla glue is that if there is not enough space given for the glue to expand, it can break the seal. As the glue will probably be dried by this time, it does make for a frustrating re-gluing process requiring stripping the glue and possibly sanding the leather. Gorilla Glue has been reviewed many people throughout the world and therefore it has a strong reputation of excellence instead of just empty claims as some of the newer products have. Unlike other glues on the market that seem to faint at the sight of water, Gorilla Glue is completely waterproof, so your favorite dancing shoes or even your work boots will be able to last for years to come. The applicator on the 4oz. container of Gorilla Glue has a pointed tip for easy application and getting into tight spaces. Even if your shoe soles are only slightly coming apart, the glue is able to not only get into the tight spaces, but provides a tight seal due to the natural expansion of the product. The product expands up to 3 times into every crack and crevice to ensure that the bond is strong for an ongoing hold. If the bottle is not sealed properly, the product can dry out within a few days. To ensure that the product stays liquid, tighten cap completely and store upright in an environment that does not exceed or go below the recommended storage temperatures. The cap of the bottle can sometimes stick making it hard to get off from a previous use. The solution is simple and the issue can be avoided if you ensure that all glue residue is removed from the cap before putting it away after use. Gorilla Glue is thinner than some other glues on the market and therefore some previous customers have expressed that it can drip onto other surfaces. The glue should be used on surfaces with a protective layer to ensure no unwanted damage occurs. It is also recommended that the user slowly apply the product to avoid any drips or unwanted buildup on the shoes. Gorilla Glue is a product that has a great reputation for excellence. The expansion of the product ensures that the seal holds tightly and the glue does not dry with a dark color, so it can be used on a variety of different shoes. The ease of application and the durability of the product makes Gorilla Glue the only glue needed for repairing shoe. In addition to being a leather glue, gorilla glue can be used on any maintenance task around the home. Offered in a tube, the all purpose glue adheres to leather, rubber, and vinyl. It is a professional grade product suitable for holding the soles on shoes as well as binding together leather to leather. The glue has a very potent aroma and so those using the it are advised to have plenty of ventilation. There is no odor after it dries. Those which require a great deal of glue may want to use the 32 oz opion offered by the same company. However, for binding the leather on shoes, the tube should be good enough for most jobs. Highly professional grade formula seals leather to leather permanently. The glue dries without the need for a clap on the pieces. Very strong aromas. You will need to ventilate the area. If you ever have glue dry on the lid of the tube, it is pretty much useless. As the glue is rather messy regardless of the needle point nose, it is essential to clean the tip after every use. This is the best glue for leather shoe artisans who want to have a professional look and a firm bonding between the leather as well as the rubber soles of their shoes. Bard seems to be an industry standard for binding leather, whether that is on tennis shoes or on luxury hand crafted shoes. When working with BARD leather glue, keep the lid on the container when not in use and have some thinner nearby to handle any messes which may occur. Still don’t know which to buy? ​The best way to find the proper glue for your project is to seek out the advice of a professional leather artist. The artist will be able to show you which glues he or she uses and explain to you the purpose of the glues being used. Consideration should be given to the volume of glue that is required for the project being worked upon. If you are doing extensive gluing, buy multiple tubes or upgrade to a pint or quart container. Just make sure you keep the brushes clean if you do. When purchasing any non-odorless substance, it is always best to check your workspace for ventilation. Keep windows and a fan running to avoid poisoning yourself. ​Glues typically run around $5 a tube with the option to purchase in bulk. If purchasing in bulk it is strongly advised that you store the glue in a dedicated workroom or storage area with plenty of ventilation. Avoid storing your glues above your tools. If the tube gets punctured in any way, you do not want the glue dripping on and ruining your tools. Thank you for posting this informative blog on the best shoe glues to use. Shoes require constant maintenance. Small wears and tears are normal for a shoe. It is important that we use the right kind of glue for fixing it. Looking forward to your next post.